So here it is. Finally, after searching all over the web and finding….nothing(?! ), here is the actual drum notation/music for Ringo Starr’s ONLY recorded drum solo. It’s taken from the song The End on the album Abbey Road by the Beatles of course. Ringo famously said that he always hated drum solo’s but thankfully this didn’t stop him producing one of the most replicated drum solo’s of all time. It’s beauty comes from it’s seeming simplicity. No double bass drum, no Hertas or pitch bending drums; just Ringo and a pair of drum sticks. The drum solo doesn’t officially start until 0:21 but there is a little sequence and drum fill that occurs at 0:09 that I wanted to just take a look at first. It helps to set up the drum solo nicely and besides, this drum fill is just too cool to skip over. Lets take a look at the Intro first. Ringo comes into this section with a two bar drum fill starting on the ‘+’ of beat 1. The sticking remains the same throughout the first section as LR. You can of course use whichever sticking you like, it’s up to you. Throughout the recording, Ringo’s snare drum rattles on occasional tom hits giving the impression that a snare drum might be struck but the whole fill (including the first four notes) are played on the toms. Ringo leaves this fill section with a drum groove based on the tom toms. His right hand is on the floor tom and left on the high tom in between striking the snare drum on beats 4 and 1 of the bar. Here’s the actual drum solo itself and as I’m sure you will agree, it’s a glorious sight! Ringo plays 1/8th notes on the bass drum throughout, laying his alternating hands over the top. Again, there are some notes that sound very much like a snare drum but not quite. This is definitely all played on the tom toms despite the snare rattling quietly in the background on certain notes. Notice how Ringo alternates his sticking when going round the drums; from LR when moving down the drums, to RL when moving up the drums. You can use whichever sticking works best for you of course. The same figure is used throughout the majority of the solo. Ringo plays this three note motif where two sixteenths are played and one is rested. This has the effect of the figure moving across the beats of the bar and against the straight bass drum. A very cool and simple idea! Ringo ends the solo with his right hand on the floor tom where the notes increase in volume before exiting to the next section of the song. Until next time, happy drumming to you! 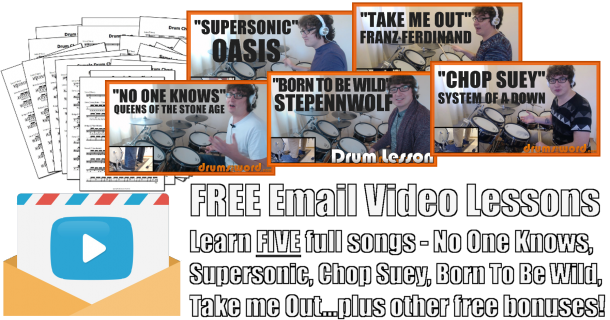 You can DOWNLOAD the FREE PDF drum notation by clicking HERE.